Formal techniques for guaranteeing software correctness have made tremendous progress in recent decades. However, applying these techniques to real-world safety-critical systems remains challenging in practice. Inspired by goals set out in prior work, we report on a large-scale case study that applies modern verification techniques to check safety properties of a radiotherapy system in current clinical use. Because of the diversity and complexity of the system’s components (software, hardware, and physical), no single tool was suitable for both checking critical component properties and ensuring that their composition implies critical system properties. 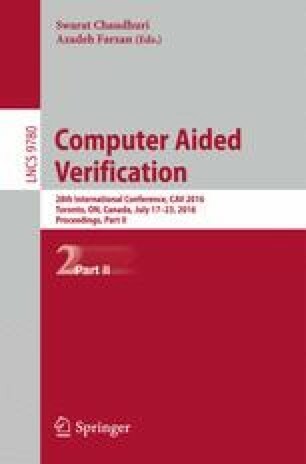 This paper describes how we used state-of-the-art approaches to develop specialized tools for verifying safety properties of individual components, as well as an extensible tool for composing those properties to check the safety of the system as a whole. We describe the key design decisions that diverged from previous approaches and that enabled us to practically apply our approach to provide machine-checked guarantees. Our case study uncovered subtle safety-critical flaws in a pre-release of the latest version of the radiotherapy system’s control software. This material is based on research sponsored by DARPA under agreement numbers FA8750-12-2-0107, FA8750-15-C-0010, and FA8750-16-2-0032. The U.S. Government is authorized to reproduce and distribute reprints for Governmental purposes notwithstanding any copyright notation thereon.